This recipe was created by Karen Wiens on 1/30/15. 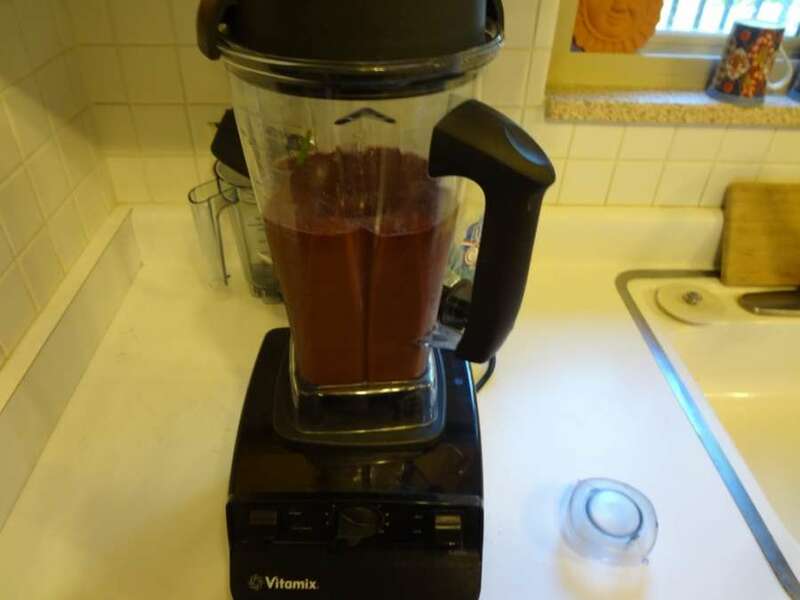 Extras – Flax seed in the smoothie while blending. Chia seeds floated on top. Include any superfood you want to add to your diet, maca, spirulina, etc. 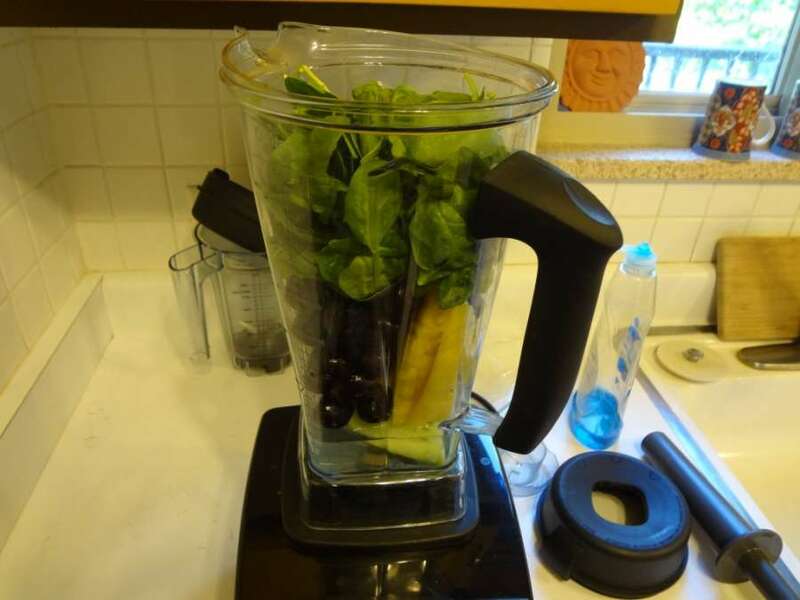 Frozen – I like my smoothies cold so I always add frozen fruit at the top. Blueberries and cherries are my favorites. 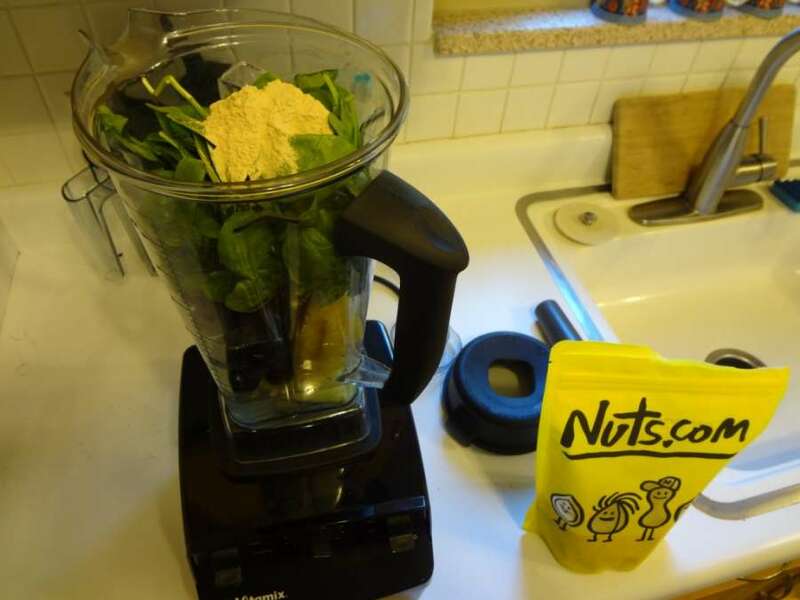 Greens – This is the most important part of the smoothie. Spinach and kale are awesome. You want to mix this up and use different greens. You can increase the ratio of greens over time. You will start to crave greens like crazy. Fresh fruit – Melon, cantaloupe and peaches are a few of my favorites. Use what’s in season or on sale. Banana – I always include at least one. It makes the smoothie super creamy. Liquid – Coconut water is my favorite, Unsweetened almond milk comes in second. You can also use plain old water. This is what my typical smoothie looks like blended up. 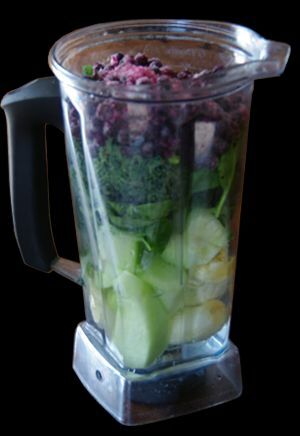 If you don’t have a high powered blender like a Vitamix, try blending the liquid and the greens first. Get them smooth and incorporated and then add the rest of the ingredients (except the chia seeds). Sprinkle some chia seeds on top. Be sure to do this right before drinking. 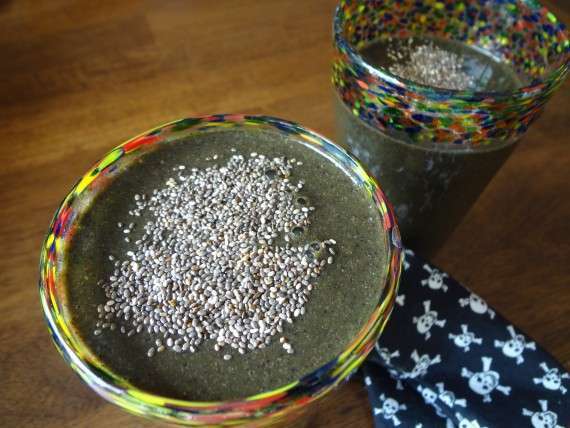 You do NOT want to let chia seeds sit on your smoothie for too long. They turn gelatinous and it’s pretty nasty. You can see the flax seed in here. Flax seed is awesome because it contains omega-3 essential fatty acids. Typically we get too many omega-6 essential fatty acids and it’s not good for them to be out of balance. Flax seed helps to balance them out. Its a healthy fat and also a great source of fiber. I blend these in my smoothie to get the good fat and omega-3s. You can also eat them whole (soak in water first) and they will help sweep out your insides. We put maca in our smoothies for a while. It kind of has a weird wang to it and I honestly didn’t feel anything different. I heard it would give me energy. I’m going to try it again at some point but so far it hasn’t been the super addition I thought it might be. Try it for yourself and let me know what you think. Oh, I love pineapple and cherries! With LOTS of spinach on top. This is a go to recipe for me when peaches are in season. 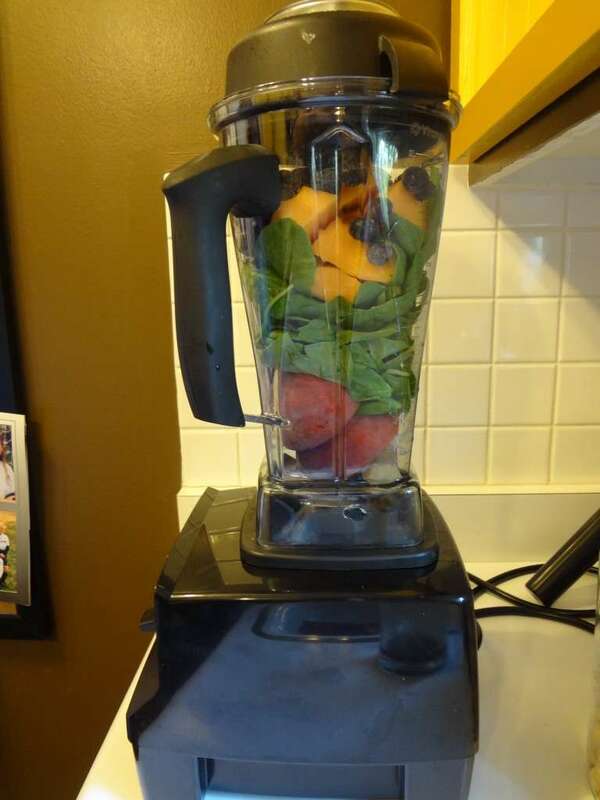 Banana, peaches, coconut water, spinach, cantaloupe, frozen blueberries. I love chia seeds. Now these, I really do feel energized when I eat them. They soak up 10 times their volume in water very quickly so they are awesome for keeping you hydrated. Be sure you soak them in water if you aren’t drinking them on top of a smoothie. You don’t want dry chia seeds in your digestive track. I’ve used them just in water running long distances too. I was first introduced to them in the book, Born to Run, which is one of all time favorite books. Christopher McDougall describes how they got him up a mountain and after that I couldn’t wait to try them. I used them as part of my fuel plan in the last marathon I ran. Are you hankering something chocolate or want to sneak some greens in your kid? This is an old favorite. 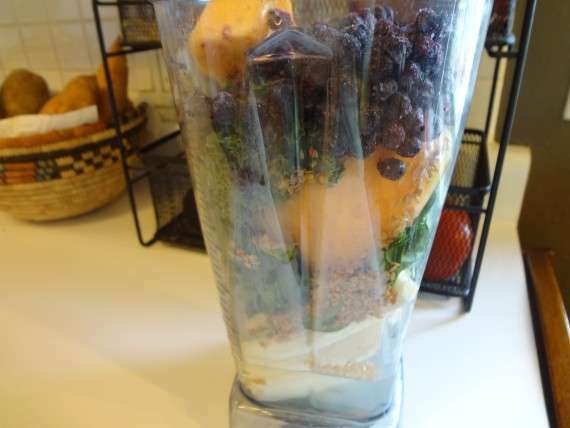 Just throw it all in the blender and blend until smooth. Amounts are per serving, based on 2 servings.